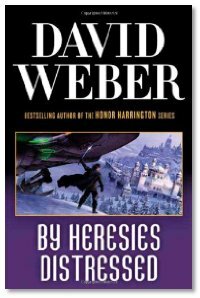 Interview: David Weber joins Michael and Michael to chat about his latest book, By Heresies Distresssed, the third volume in his Safehold series, following Off Armageddon Reef and By Schism Rent Asunder. In addition to giving an overview of the Safehold series, David talks about his writing process, and how switching between series provides a greater jumpstart for his creative batteries, keeping the different universes fresh for him. David talks about having to relearn how to craft his books after severely breaking his right wrist, and how learning and training the voice recognition software, and having to talk to create his manuscripts has changed how much he can work and also how he approaches writing his books (especially in terms of scheduling, planning and revising). He also expresses his affection for Baen Books for it's electronic library and online offerings, and its Free Library Project. Great interview. I knew using voice recording was way faster than typing, but I had no idea it was that much faster. I may have to give that a try. Thanks for that, Dragon Page. Great interview and very interesting. I had heard that David used some sort of voice recorder but I thought it was something he recorded and someone else typed up for him. Not something I could afford but hey, he has A LOT of books out. Concur with your desire to do another more indepth interview with him about his writing. Look forward to it.